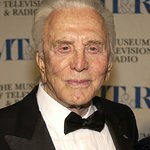 Kirk Douglas holds an annual star-studded event at the Los Angeles Mission every Thanksgiving in which celebrities help volunteers feed the homeless. The Douglases’ interest in improving LA’s playgrounds started in 1997, when Anne Douglas learnt of the deplorable condition of Los Angeles’ public school playgrounds. Along with her husband, Anne established the Anne & Kirk Douglas Playground Award to provide assistance to the Los Angeles Unified School District to enhance their schools’ outdoor and recreational spaces. 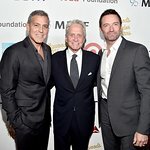 The award supports and encourages Los Angeles public school communities in creating playgrounds that will be the keystones of campus revitalization and give the city’s children the fulfilling experiences and opportunities they deserve. Google trends for "Kirk Douglas"
We don't have any videos related to Kirk Douglas.